Describe animals, places, personalities, songs and more. But do it in a strange and incomprehensible way. Because your goal is simple: as few players as possible understand what you are talking about! The less players find, the more points you score. But at least one player has to guess. And if you're not the type to like to speak, no problem: there is no turn in "Huh?" So let the players who like to talk do it for you. And listen to their hilarious descriptions, to guess what they "explain" and score as many points as they! 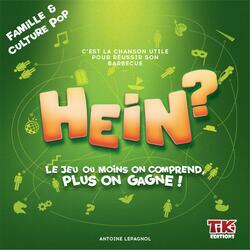 With its varied themes and known to all "Hein? Family & Culture Pop" is for a large audience who wants to spend a good time laughing to listen to absurd and funny descriptions.